I've noticed that I keep writing news "letters" in my head whenever I have the "head space" to do so. Mostly it's on a plane, like right now, while on the way to Anchorage Alaska, where I'm teaching for ten days. Of course it helps being strapped into a small seat, looking for ways to Zen-out rather than succumb to my fear of flying. I have the time and space to listen to my inner (newsletter) voice and capture it on my computer before the batteries run out. Now, if I can only send it before I leave Alaska. On top of an already hectic teaching schedule and completely out of the blue, I received a phone call from Schiffer Books who wanted to know if I was interested in writing a book. As a matter of fact, I told the representative; I was already writing books and successfully selling them as PDF distance learning lessons. She was delighted and so was I when I received the contract in the mail. I had four months to write it and silly me; I thought I could just crank that puppy out in about three weeks. I spent the first month clearing my plate of all projects and deadlines. Next, the focus was on determining and developing the scope of the book. 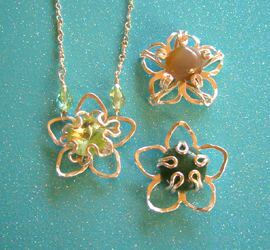 I decided to stick with wire jewelry projects and begin with simple cold processes. The projects would build in complexity and about half way through the book, require torch work. During the second month, I fleshed out an extensive outline and bought a new camera to begin taking the high resolution photos required for publishing. The third month brought me to a screeching halt when I spotted someone else's "how to" that looked conspicuously like one of my workshop projects that was included in the book. After much wringing of hands and gnashing of teeth my writer's block finally broke around the fourth month due to fear, panic and a resignation to carry on despite the "simultaneous development." I turned in the book about two weeks before it was due and one week before leaving for my first, month long, East Coast Teaching Tour. Not sure yet when the book will be released. So last summer, as more and more of my teaching venues were closing shop, cutting back or frantically casting about for fresh blood, I decided to use the time and space to extend my reach. Although I've had my eye on American Samoa (any contacts?) and New Orleans, I decided to bring it all back home first; literally. Flying into Savannah, Georgia, I used Statesboro as my home base and taught metalsmithing workshops and private lessons at Cypress Lake Studio. 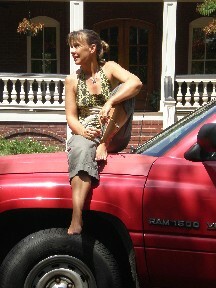 I borrowed a red farm truck (thanks Susan and Louis!) with a new transmission but no air conditioning, and drove eight hours (in 100 degrees with 100 percent humidity) through the Low Country to Wilmington, North Carolina. Next I visited my mother and enjoyed my favorite spot in the world: Wrightsville Beach. From there it was a mere four hours to the Lillian Jones Studio in Raleigh, North Carolina for some professional development and more workshops and private lessons. Next leg of the trip was to Matthews, just south of Charlotte to teach and pave the way for future gigs at The Bead Boutique. The return trip went back through Wilmington, Statesboro and Savannah just in time to drop off the red truck in the cash for clunkers incentive. The month was full of adventures including seeing old friends (hi Dale! ), thanks to the Facebook phenomena. I made some new metalsmithing friends, developed business relationships with new venues and expanded my student base. It all blended into a fantastic working vacation. Thanks Big Amanda (Owner of The Bead Boutique in Matthews, NC) for giving me a paperwork management tip: "Touch it ONE time." It's almost working. And thanks Little Amanda (Big Amanda's niece) for taking my workshop after doing the triathlon, for sharing dirty martinis and your knowledge of wine with me. Oh, the plane is starting its descent into Anchorage and my batteries are at fourteen percent. So to wrap it up: The summer was surprisingly crammed full of private lessons including folks who came to the San Francisco Bay Area from as far away as Norway, Canada and Florida. The Canadian tribe is scheming to bring me up to British Columbia next summer. What else? Towards the end of October I'll be on Maui then Oahu for two and a half weeks. Tell all of your Island friends or meet me there! The first Fall Beach Glass retreat follows in November and if I haven't started making a lot of holiday jewelry by then I'll be scrambling. Surprisingly, it's selling well even in this economy so I can continue to feed my creative passions. What's the secret? 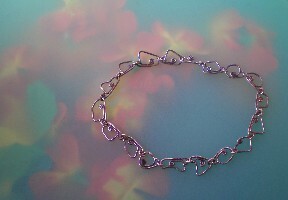 As my friend Lillian in Raleigh suggested: the more metalsmithing techniques you combine, the more unique your work will become. Writing the book then recovering from writing the book derailed my routine distance learning lesson development. I'm almost ready to begin the next one so keep an eye out for my usual "pre-sale" discount announcement. And don't forget, with all this traveling, I'm asking my domestic students, art supporters and friends to call if you are in a hurry to reach me. I'm trying to save email time for international communications and less time sensitive contact. Finally, I've begun chronicled my teaching adventures on Facebook and to a lesser extent, Teach Street. So if you've seen me wielding the camera in the classroom, there's a good chance your image is included. Tag yourself so we know who you are! Of course, if you would prefer not to be included, just let me know and I'll remove your image. 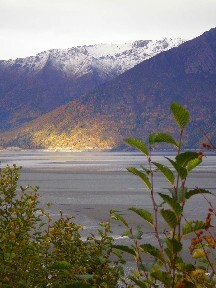 Alaska students: I'll be working on the photos on the plane, enroute San Francisco. I've been trying to formulate a newsletter that does not mention the state of the economy since we get enough of that every time we turn on the television, radio or go grocery shopping. My conclusion is that it's taking more effort not to talk about it than to just give in. Mostly I want to share with you that I'm not throwing in the "creativity" towel (and neither should you), but instead, coming to terms with the uncertain times ahead. Did you know there's a whole professional field called "change management?" The reason the field exists is 'cause folks are more likely to cling to what they know (Who Moved My Cheese? By Spencer Johnson) than adapt. I knew that I was an artist by the age of four. What I didn't know was that I would spend a lifetime of compromising (I like to call it "course correcting") in order to keep active within my field. Recently someone said "I really admire how you always manage to continue being an artist." Wow, I thought. If you only knew about all the times I endured less than glamorous "artist survival" part time jobs in order to make ends meet. [Nickel and Dimed: On (Not) Getting By in America, Barbara Ehrenreich]. Truth is, I'm used to the artist's struggle and these economically challenged times feel like more of the same, except now it's more intense because others are joining me in their efforts to hang on to the professions they hold dear. The bottom line is that I do whatever it takes to keep developing and selling my drawings, jewelry and curriculum. If it means taking on jobs that I'm not crazy about (both inside and outside of my field), I do it. Why? Because ultimately the creativity that I enjoy (as an artist and teacher) is the most rewarding thing I can do for my community and myself. If someone likes my work enough to pull out their wallet, it validates my endeavors (check out the artist JSG Boggs in Wikipedia: ). The arts (humanities) are important because they teach us what it means to be human. Viking Bezel Knit, taught at the Beach Glass Retreat. Creativity sells. Not just in the arts but in all disciplines. I used to tell my college students at Eastern Illinois and Georgia Southern University: "Show me something that I haven't seen before." To make a living at making stuff, I've always kept my price points reasonable, even when my retail venues encouraged me to charge more. Finally, there's just plain old hard work in terms of cranking out a lot of pieces to reach the "success" tipping point. [The Tipping Point, Malcolm Gladwell]. Keep in mind that if I want to earn a hundred dollars a day, I have to make at least two hundred dollars a day's worth of sellable goods: every day! Some formulas triple and quadruple that amount of production to support staff and overhead. How do you keep at it even when you are left uninspired, overwhelmed or just tired? Like the child sitting at the piano while their friends are out playing in the sunshine; art is a discipline and practice makes perfect. Check out the article "What it Takes to be Great," Geoffrey Colvin: http://money.cnn.com/magazines/fortune/fort une_archive/2006/10/30/8391794/index.htm . During these rough times, my mother's words of wisdom are re-gaining relevance. Money statements like: eating at home is cheaper than eating out. Saving your money is better than using credit cards. Your rent/mortgage should not be more than one week's worth of wages (boy, now that's a tough one). Marty Nemko keeps me on track: http://www.martynemko.com/ and of course anything by Suze Orman. As a role model, my mother also taught me to develop a satisfying hobby that you can come back to everyday to relax your mind and enrich your soul. I'd like to add a couple of my own truisms: the key to longevity and mental clarity is to surround yourself with like minded friends (and students! ), read an hour each day and of course, learn something to develop new pathways in the old noggin. Besides making art and teaching, I love love love to travel. In the first twelve days of January, I drove 3,000 miles. First stop was Lassen (Volcano Country) in Shasta County. Tosca (my trusty hound) and I stayed with a couple of friends (Hi Tina and Eve!) for a few days. It gave me the opportunity to work on some of my projects and I even sold some work. Next I drove west to the coast and then north to The Gold Coast in Oregon. Marlene (who has a passion for jewelry making when she's not helping to save lives at the hospital for her day job) and I had a blast. She took several private lessons from me and I think there would have been more lessons if I had stayed longer. It took all day to drive back to Marin. The Northern California coast, Redwood- and rain forests were amazing. I found a beautiful agate stone on the Oregon shore which I easily transformed into a necklace and wore for days. I also found an excellently crafted sterling silver Navajo cricket pin at a museum that I bought for my mother. Oh and I almost forgot, there were more elk sightings than you can shake a stick at. After returning home for only one full day I took off again to go to the Santa Monica/Newport Beach area of Southern California. A group of ladies organized themselves to bring me down for a weekend to teach them the Viking Knit and Bezel workshops. There was lots of great food and fun. I'm secretly hoping they'll find something else that they want to learn and invite me back! Hint hint hint. Check in Friday Feb. 6th. Check out Sunday Feb. 8th. What better way to get away from it all than to join us at a Bed and Breakfast (home cooked) on the wild Mendocino coast? 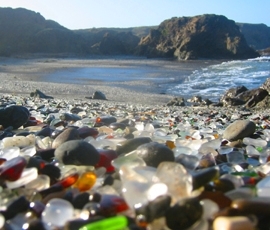 The glass beach is almost unworldly in its beauty. I've combined the Viking Knit and Bezel Knit workshops (excellent technique for capturing sea glass) which I run simultaneously for a discounted (combined) cost. New students will find the atmosphere personable and relaxing. Return students are invited to participate sans the instruction cost. Because we meet each year before Valentine's Day, the rates are still off season and very reasonable. To find out more, go under the News section of my website. 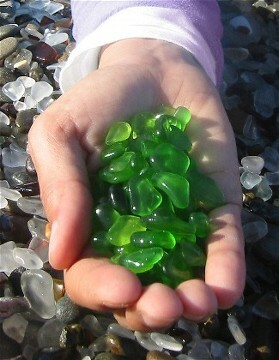 If you're seriously considering signing up, email a request to me with the subject: Beach Glass Retreat 2009. Hurry, it's only a few days away! Two years ago I was so crazy busy that my "to do" lists didn't leave any room for error. [Faster: The Acceleration of Just About Everything, by James Gleick]. One mess up would lead to a cascade event. A year ago, many of my retail venues permanently closed their doors. This year, I have the time and space to add new schools and develop more classes. What a pleasure it is to teach workshops at a school that is within a ten-minute drive from my home! Check out my website calendar to see what I'm offering at Mt. Tam. Back to the Hawaiian Islands of Maui and Oahu: April 16-26th. The University of Hawaii's VITEC Program at the Maui Community College has agreed to have me teach several classes this time. We even get to play with fire! I'm excited about introducing fusing techniques to my Maui students. I'll also be available to teach private lessons. Deadline for requests is (of course) way before I get on that plane so contact me right away if you're interested in booking me. Like this design? Sign up to be a distance learning tester. As for The Bead Gallery I'll be teaching three of the Matchsticks workshops: Color! Lotus Blossom and Pretty Prongs. You can check out the photos and descriptions on my website. In addition, several students have organized to have me teach them soldering outside of the store setting. Contact me if you would like to join the soldering group or book your own private lesson. The goal for private lessons is, of course not to compete with my venues. If you're interested in customizing your interests or you need a portfolio review (course correction) contact me for rates. Hint: they are cheaper than therapy. BTW, several years ago I taught 13 year old twins Max and Amelia at my studio and drawing class at City College of San Francisco. Max's interests in the fine arts have settled on film making. Check him out at http://www.youtube.com/watch?v=JrGLhn3W1DU . If you look closely, you'll catch a glimpse of my Borzoi, Tosca and I are in one of the film excerpts. Motel 6 Allows Dogs. Just Checking to See if You're Still Reading. I am currently putting together an itinerary to drive (yes drive) 'cross country at the end of July through the middle of August. The goal is to teach in Statesboro, Georgia; Raleigh/Durham and Wilmington, North Carolina. I don't have the route and exact dates mapped out yet, but if you live anywhere on the northern or southern route across the country and you would like to have me stop by for a private or group lesson, please contact me as soon as possible. My travel time will expand/contract accordingly. Marin County jewelry designer Iris Sandkühler will be holding two workshops on weaving silver wire chains and knitting bezels around sea glass from Friday, February 6th to Sunday Feb. 8th in Fort Bragg on California's Mendocino Coast. Two simultaneous workshops are available, depending upon the student's skill level and interests. The workshops will be held at the Beach Glass [bed and breakfast] Inn in Fort Bragg. Cost for instruction is $75 plus $45 for tools and materials for the weekend workshop. Students will visit local beaches to view "beach glass" from discarded glass items smoothed over the years by the surf and sand. Additional cost of accommodations varies based upon room choice. Space is limited, and registration is required. For more information, contact Iris Sandkühler at 415/312-8050 or via email at isandkuhler at yahoo dot com. 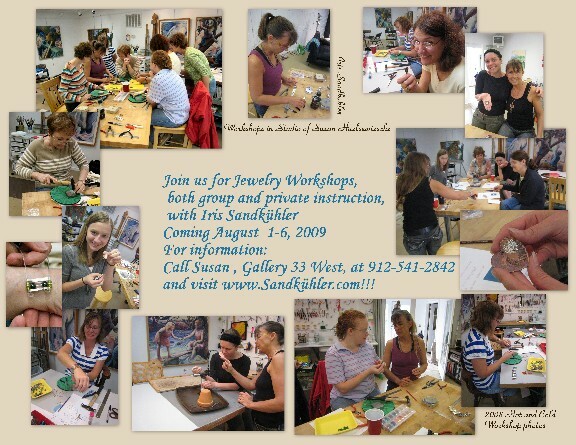 To learn more about Sandkühler's art, distance learning classes and onsite workshops, see www dot sandkuhler dot com.